Another winner from Smitten Kitchen's blog! When I first saw her post about this, I thought, nope, this one is NOT gonna be on the menu any time soon! Just did not sound that appealing. 1st off, her descriptions make you WANT to try this. And then, when you DO try it, you want more. I made this for a family gathering on Sunday, and it was met with raves, oohs, and aah's! I can't wait to try it again! Lately we have had to keep the chickens in their own, private courtyard, which is attached to their hen house. Eggs being found in random places, scattered willy nilly, all around the yard. Hopefully having limited freedom will encourage them to lay IN the hen house, not around it! Out of the hen house bright and early, but confined to their courtyard till around 4pm. By 4pm, any laying they are going to do has pretty much been done. At around 4pm, I let them out to run around they yard. They take full advantage, and are seen hanging out by their coop door till the very last ray of sun has set. A few eggs now being laid IN the hen house, but in unusual places. Next to their water dispenser. But nothin' in their actual nesting boxes. This clematis starts out in the spring on the OTHER side of this rose bush, in the inner courtyard of the front yard. Teeny-tiny in the spring, one thinks it will never get going. 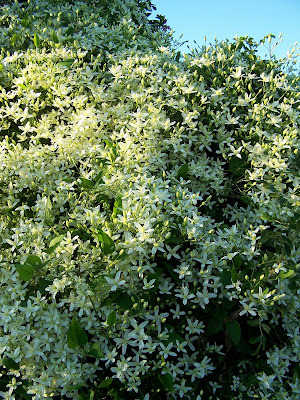 An explosion of tiny, white star-like flowers with a heavenly fragrance has engulfed the entire corner of the courtyard garden. This view is from another side of the courtyard garden, again, across the fence from where the plant actually is. Lots going on in the kitchen this week as I begin roasting Roma tomatoes, making sauces, and canning applesauce. A big day comin, later on this week, tho. You'll hear more by Saturday! tweaked the dining room table and factored in FALL! 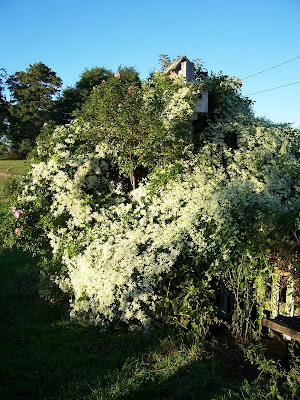 and oh yeah, the clematis reigns here in all her glory! I have to agree with you, it doesn't seem appealing at first, but I sure trust your advice. I hope to try this! those dang chickens. They're so cute though. Good morning! Funny about your chickens not laying in their boxes! Makes egg-gathering just like Easter! 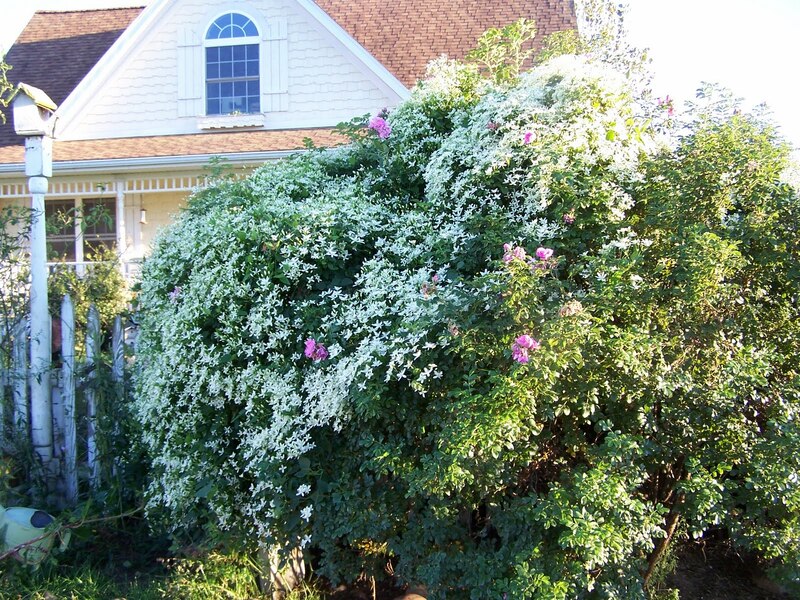 I was admiring your beautiful clematis. I have some purple ones that bloom early on in the summer, and then I have another one that is just now beginning to get some little blooms on it. AND I don't know what variety it is, so maybe it's going to be like yours! YEA! That clematis is stunning! I love fall too,it is my favorite season...it still has a while before it makes it down here! have a blessed day and enjoy your delicious bread..
cindy, grape and rosemary....mmmmm...but the bread....definitely yummy! Autumn is my favorite time of year. The clematis is beautiful!!! 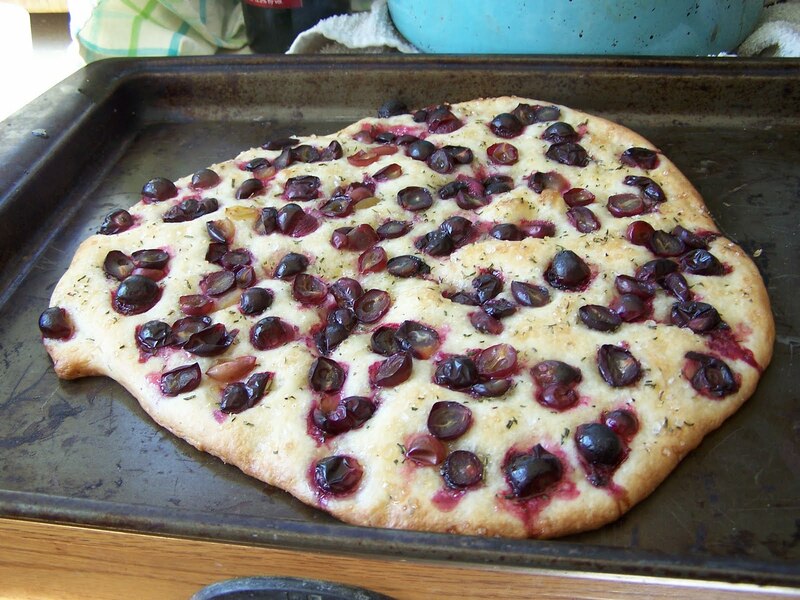 The focaccia is calling my name. Oh I can smell that focacia from here, Cindy! P.S. Enjoy your kitchen time...I'm sure it's all smelling and tasting yummy! I saw the recipe on smitten kitchen too and thought...strange, but I really want to try it. so I saved the recipe and now I need to find concord grapes!!! I think this recipe looks and sounds delicious! 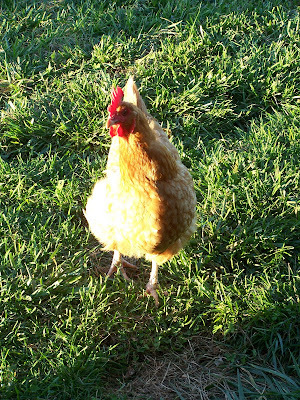 Those silly chickens, but you have the excitement of an egg hunt every day- not just at Easter! I have never heard of using grapes with any kind of bread before! I do have a wonderful recipe for a potato and rosemary focaccia though. My chickens are either laying around here & there as well, or we have a few who have stopped laying - I'm thinking I may have to follow your policy & lock them up until they are all laying in the hen house again (I'll keep them in the run which has plenty of nice green feed so it won't effect the quality of eggs). Your garden is just beautiful - how I would love to take a walk with you around it! We're having the same problems with our hens. We have found clutches of eggs under a car, under the wood pile... all kinds of places. 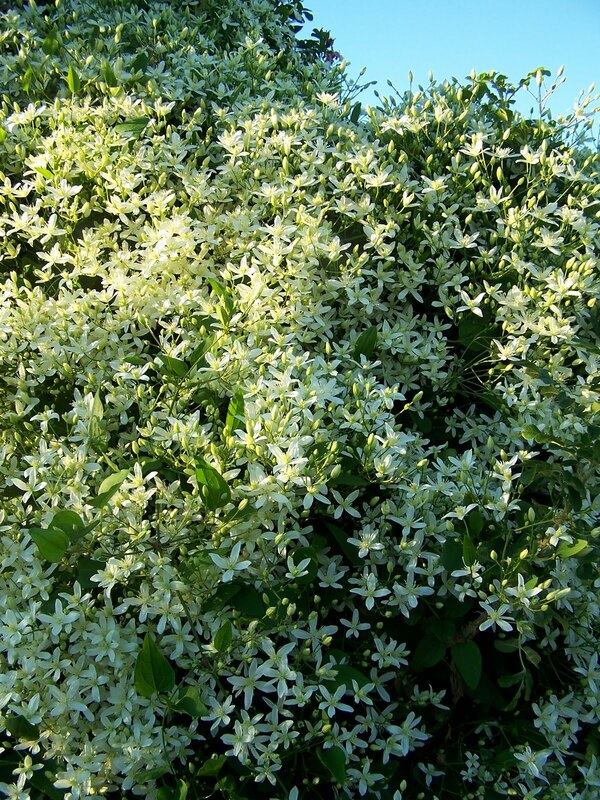 Love the clematis. I've never tried to grow any myself but it's on my list of things to grow eventually.